The Chaos de Montpelier le Vieux (Chaos meaning heap of rocks) is located in La Roque Sainte Marguerite, north east of Milau. 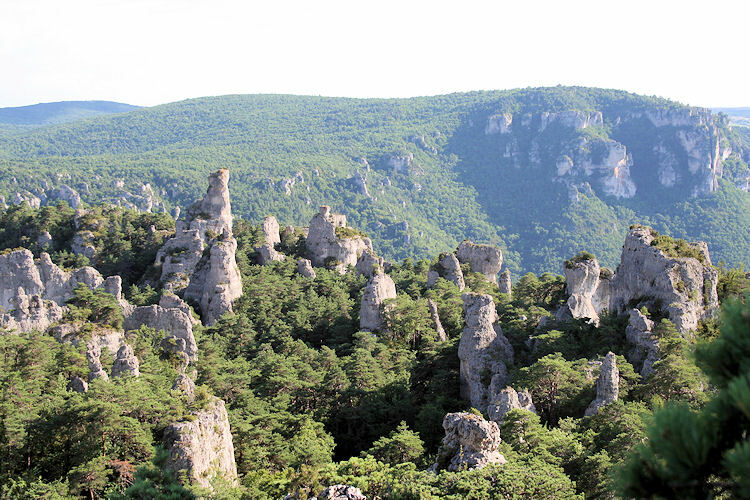 Now a listed site of natural beauty, the strange formations of rock resemble an ancient city, where millions of years of erosion and rainwater have carved shapes of pillars, arches, human faces and animals out of the heaps of dolomite rock. (Some rocks have been given names such as; Queen Victoria, the Bear, the Crocodile, the Elephant, the Sphinx and the Arc de Triumphe. Buried in vegetation and too rough to be tamed, it became a wild place inhabited by wolves and legends of fairies, witches and strange spirits and was abandoned by shepherds for thousands of years. Small oak trees, boxwood, juniper and wild thyme are found together with many other Mediterranean flora and fauna. You can hike over five colour coded trails that follow natural passages formed on the rock or you can take a train on tires. The walks range from 30 minutes to 2 hours. It is advised to wear good walking shoes and remain on the trails.